Having just signed to ‘Holm Front’ and releasing a very nicely received ‘Sunday School EP’ in the process, it could be said that Ugly might just be one of the hottest bands in the UK right now. That’s why we’re over the moon to have ‘em headlining our first venture into London. Leeds’ Little Hand Feet will be bringing angular, soulful art rock – the kind you’d expect if Omni kissed Andy Savage in the presence of Parquet Courts. Expect a frantically ADHD induced rock-coma. 6 piece, Kill Liz serve you a taste of scrapbook rock. Cambridge’s answer to Knebworth. El magico. 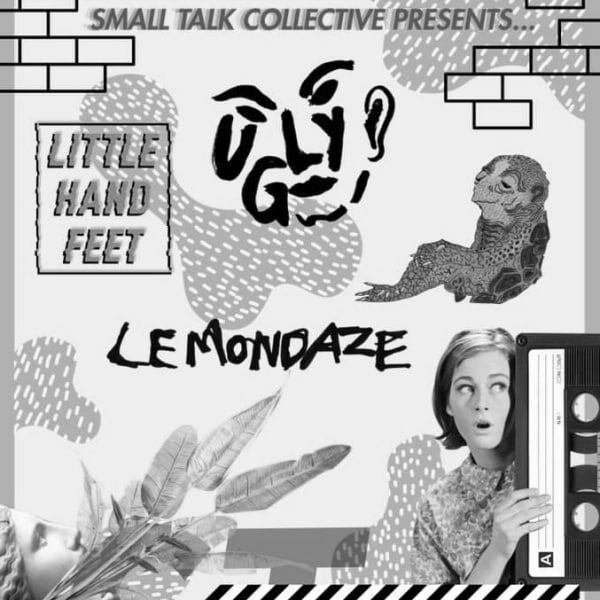 Having supported Gengahr, Bloody Knees, Hinds, Sports Team, Kulk, Boy Azooga, Yves, and more just in the past year, it’s no secret Lemondaze have fast become Cambridge’s best kept secret. Well uh oh, the secrets out, come see what all the fuss is all about. We’re very excited to have these legends open up for us. Expect loud, fuzzy, swirly, riffy shoegaze.